Fatherhood is something I am still getting used to, but seems to fit me well. Being a dad is incredible. Every day I have the ability to build a stronger bond with my son. I have a million choices to make about where I spend my time. The effects of those choices will be life long. The memories we as adults make everyday seem to blur together. I now look at things and think “there’s always tomorrow” when I mess something up or skip doing something I shouldn’t have. Every day dads are faced with questions like this one at about 4:55 p.m. “Do I spend that extra hour at work or should I come home as soon as I can to have dinner with my family?” or at around 10:30 p.m. “Should I finish this report for class or laundry before bed?” The memories I’m making with my kid while he is young will stick with him for years. I keep reminding myself of that. I have work to get done, but my son needs my attention too. Yes I need to take care of myself. The better I am at doing that the longer Ill be around for my wife and son. I also have to remember that in the not too distant future when Wesley asks to play or spend time with me I need to make it a priority. I sometimes think that I can hangout with him another time, but if I do that eventually he’ll only remember a dad that’s too busy for him. I don’t want to be too busy for my son. It will happen sometimes for sure, but I’m making it a personal goal of mine now to minimize the times that it does happen. I do miss the amount of sleep I got during my pre-fatherhood stage of life. My concentration suffers now more than ever. Wesley needs my attention. He’s not a fan of being put down or being held while the holder sits. Standing you must be when holding him or a cry you will hear. Diaper changing and baby holding is becoming second nature to me. I never would have been able to eat and hold a baby on my own 11 week ago. I’ve had some practice since Mr. Dude was born. 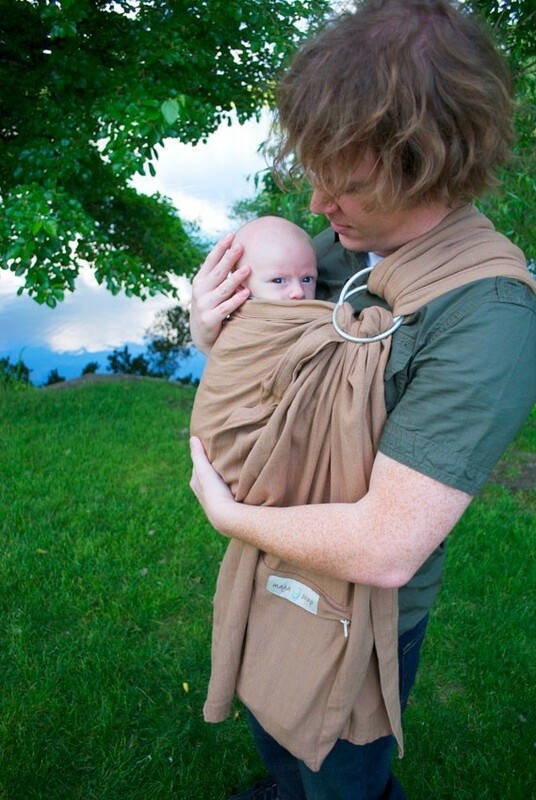 I can’t recall ever noticing a man wearing a Maya Wrap or other baby carrier before the process of becoming a dad started. Not in person at least. I was obviously around plenty of dads growing up and probably saw one or two baby holding, but they don’t stick out in my mind. It was for a very long time something in my mind that only moms did, not dads. I’ve grown a lot in my viewpoints on life, raising a child and taking care of their the every days needs as a parental team has also evolved. When you have kids, or even just one kid like I do, you don’t get a day off. You don’t have a chance to play catch-up. If you happen to stay up too late, or party too hard, or go out and get a little tipsy, you aren’t getting the extra sleep you need the next day. You’re not getting a chance to sleep in until your hangover goes away or you get some energy back. You get up when your kid gets up and you follow him around doing everything he needs because you’re his slave and that’s your life now. Sports give you a break. Half-time, off-season, etc. Parenthood does not. It doesn’t stop. It is super intense, but also incredibly rewarding. I am blessed to be part of a parenting team for sure! Abigail is my support and many times trainer when it comes to kids. I’ve always liked and been comfortable around kids, but not babies. A lack of time spent around babies was the reason. Wesley was the first baby I ever held for more than a minute or two. Abigail has been an incredible support to me and I find it really empowering to know how to take care of a kid properly. I love her and am a lucky guy to have her be in my life. Fatherhood suits me. It does indeed. Great post! 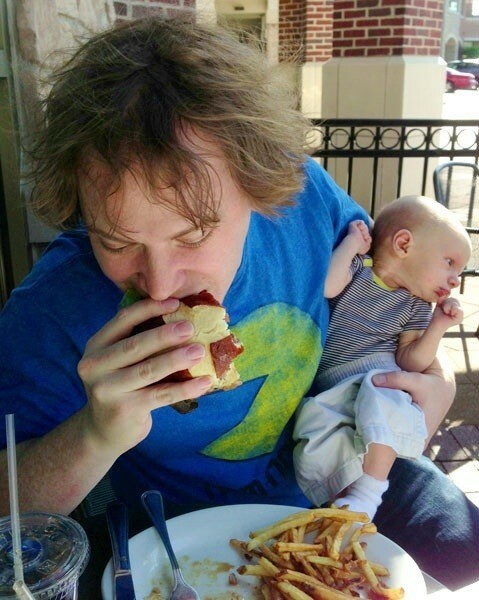 Having become a father just over 8 weeks ago, I can really identify with a lot of the things you mentioned (…especially learning to eat and hold a baby at the same time!). Great Post! We have a 13 month old little girl. She is a blast! I like your mentality of a parenting team. Next story My First 100+ Days of Fatherhood*, Check.